A kitchen counter stool with a steam bent seat and tapered legs tenoned and wedged into it. In solid ash and oak with a Windsor chair type construction. 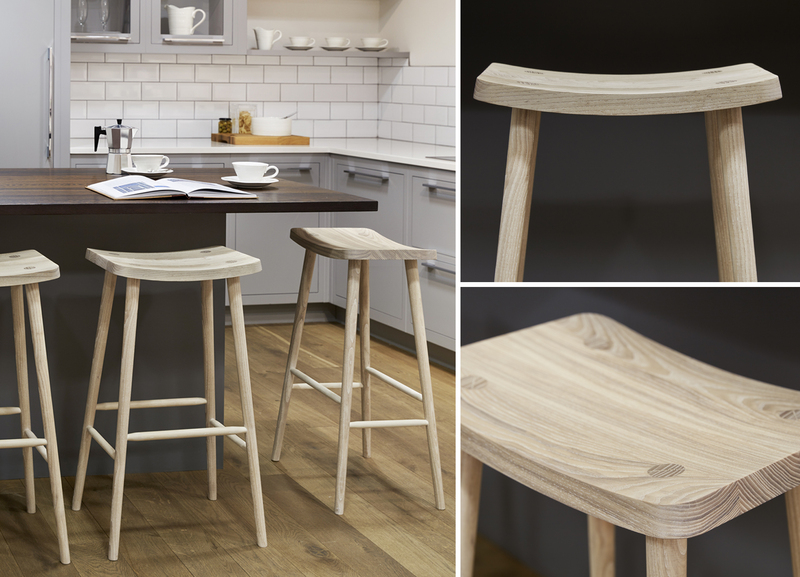 The form of the stool comes from thoughts on what it is that everyone loves about kitchens, they are often described as the heart of the home and ‘happy’ places. This lead to the smile shaped seat which provides comfort in the form of a saddle. The legs are elegantly tapered and have a generous splay, making the stool very stable. They are also tenoned through the seat and then wedged, which provides both strength and a neat visual detail which is normally associated with quality craftsmanship and elevates the stool above the inferior imports that are found in the same price bracket.